I hope The Dude had the forsight to TIVO the premier of 24 last night. I forgot to ask him to do that when we were on the phone yesterday and now I'm really hoping he did it anyway! I'm going to be missing the first two episodes, but will be in the States for the third episode, and I want to make sure I've watched the first two before getting into the show. 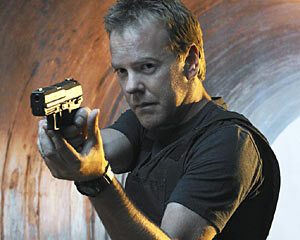 Last we saw Jack Bauer, he was heading on a barge to China! I heard the first 5 minutes of the show were absolutely incredible so if you watched it, drop me a line and let me know what you thought (but no spoilers please! Once again, I'm stuck in my apartment waiting for Yehuda to come and fix the new leak. I'm really starting to get tired of all the problems in this apartment. People come over and ooh and aah over my apartment but they wouldn't be so complimentary if they had to wait at least once a week for the contractor to fix yet another problem. The person who moves in here after I leave will be so lucky, all the kinks will be worked out for that tenant! I'm halfway through my final paper for class tomorrow and just need to wrap up some stray thoughts. It's not an easy paper to write as the concept of an American Jewish Writer is truly complex. I also have to type up and send to Tamara a few key points from one of the essays we had to read this semester. Since I missed the last class, Tamara lent me her copy of the essay and while I photocopied it, I didn't have a chance to return it to her before tomorrow. Good thing I'm a proficient typer, at least I won't be spending hours at the computer uploading the document for her. So, I woke up this morning with heartburn, which I haven't had (fortunately) for nearly 3 years! Heartburn has become my breaking point, and I spent two hours this morning surrounded by my Weight Watchers materials, a calculator, my WW calculator and half of the contents of my refrigerator. A couple of years ago, I joined WW and lost 20 pounds. While I actually attended weekly meetings, one of my good friends also joined the program but she was doing it online, and together we kept each other motivated. We shared recipes, discussed meal ideas, exercise points and helped each other through the ups (there were many) and celebrated the downs (which were also terrific!). A few weeks ago, she had a baby, and now she is back on the program too! The first thing I did today was call my trainer and schedule another appointment with him (Thursday afternoon) and asked him to help me figure out how to read the nutrition labels on food packaging. The problem isn't the Hebrew (I did need him to tell me what word meant "dietary fiber") but that everything is in grams as opposed to cups/ounces or spoons. For example, my loaf of pumpernickle bread is 750 grams total. The nutrition label is per 100 grams but since I've already consumed more than half of the loaf, I have no idea how many pieces equals 100 grams. Yehuda helped me figure out that 100 grams is roughly 2 slices of bread. I was on my own though when it was time to convert my diet Hummus from grams to cups/tablespoons. Fortunately, I was able to figure out that 50 grams was 3 1/2 tablespoons and at that amount it was extremely reasonable for me to calculate the points. Once I had points for half of my fridge, I was able to pull together meal ideas for the week. Today is already planned and tomorrow is a bit up in the air. Since I have class, I need to make and bring stuff that won't spoil in my bag but will also keep me going during the day. We're also having a party (I'm making cold sesame noodles with peanut sauce) so I think I'm going to pack a meat sandwich (which low-fat smoked turkey breast) so I won't be tempted to eat any of the other food and junk at the party. My next challenge is figuring out how to eat out at restaurants while on the WW program. When I went on WW a few years ago, I swore off restaurants which helped tremendously. That's not to say that I didn't go from time to time out to eat, I did, but it was very rare. Lately, I've been going out to eat at least 2-3 times a week! That definitely has to come to an end, and soon! I'm going to Jerusalem after class tomorrow so I'm going to suggest sushi for dinner. It's very filling and low in points, so I can eat enough to keep me satisfied and not feel like I'm going off the program. Anyway, I have to get moving on my paper, on typing up Tamara's essay and cooking for the party. Literature of the day is Eric by Doris Lund, a true story about a boy who with cancer told from his Mother's perspective. A very stirring and emotional novel, and a must read!